Peonies 2, 2018. 18000 hand cast encaustic crayons, 12 panels, 35 1/2 x 46 in. Gi-saeng, 2017. hand cast encaustic crayons, 6 panels, 28 x 42 inches. Foundations of Sand, 2017. 61 x 55 inches, shredded cotton/rag paper, toner, 24k gold leaf, cast stoneware lamb heart. Melodie #66. 14 1/2 x 14 1/2 inches. 2200 hand cast encaustic crayons. Peppermint Candies 2017. 2 panels, 4400 hand cast encaustic crayons 14h x 28w inches. 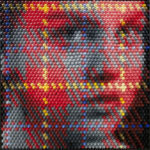 Kim Foster is pleased to announce an exhibition of new work by Christian Faur. This will be Faur’s third solo exhibition that will inaugurate our newly renovated gallery space. While Faur is internationally acclaimed for his portraits created by hand cast crayons, this exhibition will include a wide range of material and genres. Among the pieces to be exhibited will be Faur’s largest crayon work to date; shredded paper image moments before a nuclear test blast composed entirely of religious text; flag of dyed and sewn dollar bills; crayon portrait based on a Dorothea Lange photo in the FSA collection; umbrella of human hair; and print mapping the King James Bible to a color alphabet font. The things that inspire me to create, I find, are buried deep within the structures and systems that form the underpinning of our natural world. My studies in the natural sciences have made me aware of these hidden layers of complexity present in even the simplest objects. These invisible layers are seen most clearly through the lens of logic, which is used to decipher the underlying rules and laws that govern the physical world. In my work, I try to mimic these elegant structures of nature by developing systems of my own with which to express my thoughts and ideas, so that the medium and the message appear as one. I think of it like a game, with a set of axioms that are established at the outset through the limitations of the material or forms from which the work is constructed, which then dictates what can and cannot be “said” within the boundaries of the chosen medium. This material limitation can also be a strength, as there is the potential to contain thoughts and ideas in unique ways, so that the “medium” can become the “message.” This intertwining of form and function can be seen most directly in my most recent work, which is comprised of crayons, shredded paper, dollar bills, and even a color based system of writing. These systems function as a private language, that allows me to express many layers of meaning within each work that I create. I think of them as complex visual “poems,” which can redefine the way we think about the meaning of communication. Faur has developed a technique for using a familiar object to stand in for the photographic pixel, recreating what is hidden from our visual perception by replacing these invisible elements with hand cast crayons. This expansion of the pixel allows us to see the structure and scaffolding behind the surface of an image, opening the viewer’s eyes to the hidden patterns and complex arrangements of points that make up a photograph. He begins by deconstructing a single image into its most basic elements of tone, color, form and resolution. Using traditional artists’ pigments and an encaustic medium, he then hand casts the exact colors and quantities needed for each of the crayons used in a work. 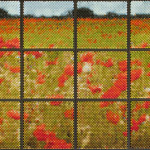 A highly manipulated “low-fi” image is then laboriously reconstructed with these individually cast wax pixels. Playing with the ordering and sequencing of these new “picture elements” creates a diversity of surface textures and effects. This process suggests elements from both high and low culture, from mass market products like Lite- Bright to Seurat’s technique of pointillism. B.S. Physics (Deans List), 1997, California State University Northridge, Northridge, CA. (Minor in Mathematics).